Since this is the weekend before Halloween, I thought it might be fun to do a theme ride today. My first idea was to ride out to visit Bela Lugosi’s grave, but that turned out to be about a 60-mile round trip from Pasadena, so that was too long for a Sunday ride. So instead, we visited Hollywood Forever and Forest Lawn to visit a few music legends. We rode west from Victory Park, taking Orange Grove, Colorado, and Yosemite to get to Eagle Rock Blvd. Then we took a left and headed south, turning right on Ave 36 to get across the L.A. River and into Silver Lake. Then we crossed the Shakespeare Bridge and took Franklin Ave into Hollywood. Just before we got to the turn at Bronson, we saw a couch on the side of the road. So I stopped and collected it for the Abandoned Couches Blog. At Bronson, there was a cutout bird hanging from the wires overhead. 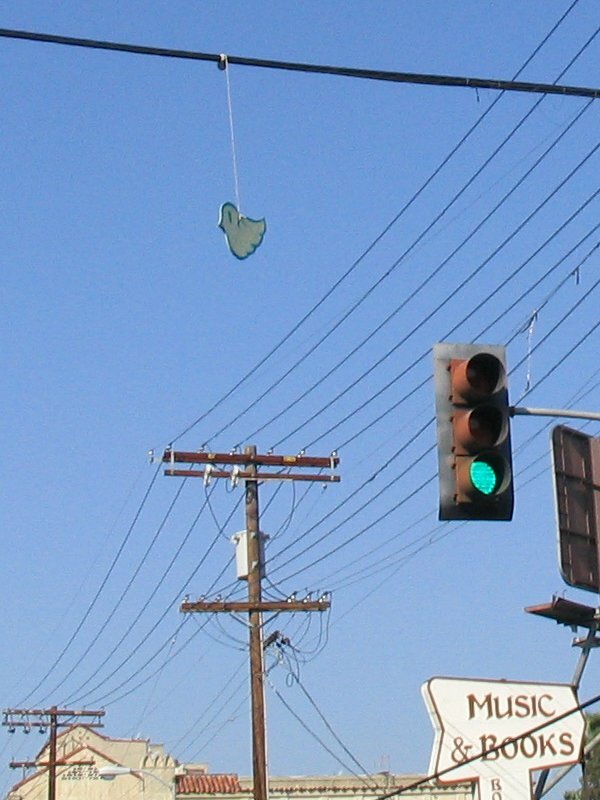 I’d read recently that there is someone going around hanging up these little cutout birds above streets in Hollywood. Then we turned and took Bronson south to get to Hollywood Forever Cemetery. The guard at the gate was very unpleasant, and he insisted that we were not allowed to ride our bikes into the cemetery. This seemed a bit odd, since we’ve been there many times before and never had a problem. Normally, the people at the gate are very pleasant and helpful. But they were having some special events there this weekend, so maybe that was why they had a guard there. So we agreed to walk our bikes into the cemetery. John, Jon and I all walked in. The rest of the group decided to just continue the ride. We walked in, going back to the pond to find Bianca Halstead’s grave. She was the singer and bass player for Betty Blowtorch. They were just on the verge of making it big in 2001 when Bianca died in a car accident after a show in New Orleans. It’s a sad story, but it’s pretty clear from her grave that she still has a lot of fans who miss her. Just a few feet away was Dee Dee Ramone’s grave. We’d been there to see it before, but this was the first time I’d noticed lipstick kisses on his stone. Again, it’s plain that he still has fans who miss him. Leaving Hollywood Forever, we retraced our steps back up to Franklin, and then headed up Beachwood toward the Hollywood sign. The route took us up a very steep hill to just below the sign, and then down the other side and past Lake Hollywood. Then we rode down into Burbank to Priscilla’s for a bagel. And after riding up that hill, we really appreciated the bagel. After the snack stop, we rode to Forest Lawn. We entered the cemetery and rode to the Courts of Remembrance. There, we saw the graves of Bette Davis and Liberace. Not at the same time, though. Bette is at the front of the building, and Liberace is buried with his mother and brother near the back. Leaving Forest Lawn, we rode back across Glendale, going up the big hill on Chevy Chase and Linda Vista. 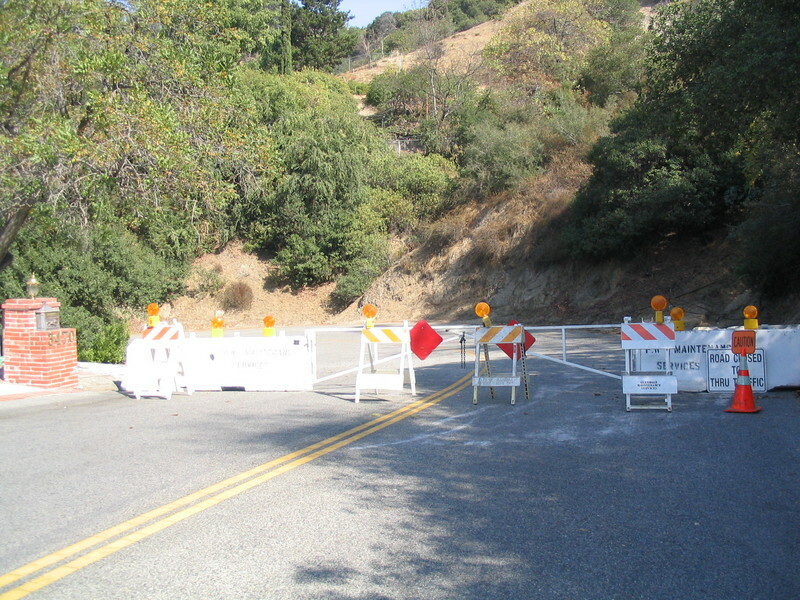 There was about a 50-foot stretch of road that was closed for no immediately apparent reason. So we portaged the bikes over the barricades and kept riding. Then we rode down Lida and went around the Rose Bowl. Then we took Orange Grove back to the park, picking up a couch near Fair Oaks and another near Lake.